Why is it that the behaviour of teenagers can be so odd? As they grow older, young children steadily improve their sense of how to behave, and then all of a sudden, they can become totally uncommunicative, wildly emotional and completely unpredictable. We used to think that erratic teenage behaviour was due to a sudden surge in hormones, but modern neuroscience shows us that this isn't true. 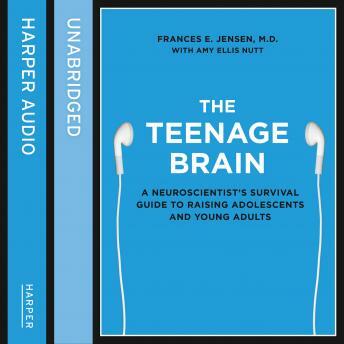 The Teenage Brain is a journey through the new discoveries that show us exactly what happens to the brain in this crucial period, how it dictates teenagers' behaviour, and how the experiences of our teenage years are what shape our attitudes, and often our happiness in later life. Many of our ideas about our growing brains are completely re-written. They don't stop developing at the end of our teens - they keep adapting until we are in our mid-twenties. They are wired back to front, with the most important parts, the parts that we associate with good judgement, concentration, organization and emotional and behavioural control being connected last of all. The Teenage brain is a powerful animal primed for learning, but this creates problems. Addiction is a form of learning, and Frances Jensen, Professor of Pediatric Neurology at the teaching hospital of Harvard Medical School reveals exactly what lies behind all aspects of teenage behaviour and its lasting effects - from drugs, lack of sleep and smoking to multi-tasking and stress. As a mother and a scientist, Professor Jensen offers both exciting science and practical suggestions for how parents, teens and schools can help teenagers weather the storms of adolescence, and get the most out of their incredible brains.